Discussion in 'Available / Expiring Indian Domain Names' started by Ace, May 20, 2016. There are about 245,114 names (53.63%) remaining. coreyg, LLL.in King and Jeff like this. Thanks Ace - any stats as to percentage registered? rate at which they are being registered? Updated the post. Thanks for pointing this out. Thanks - good to know. Interesting stats. I like all the charts - very helpful, thanks. 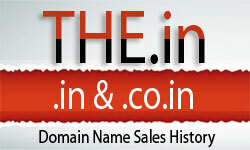 historically the LLLL.com buyout occurred sometime in 2007. I think that the buyout may have then subsequently ended in around 2009 and re-occurred in 2013 (going from memory, so dates may not be exact). So the buyout occurred much later than that. I think even years before the initial buyout, CVCV.com's were bought out as they have always been popular terms. You are correct, the LLLL.COM buyout did not last , the reason I bring this up was that it took so long even fpr .COM to have a buyout and to expect .in to better .COM is just being plain stupid or naive. During the NamesCon this year, I briefly talked with another domainer who was looking at .in with contempt and just to sound too pompous inquired that if there was a LLLL.IN buyout. Jeff and LLL.in King like this. coreyg and Jeff like this. LLL.in King, coreyg and Jeff like this. LLL.in King, Hitesh Wadhwa and Jeff like this. Where I can find the list for "CHIP Names Available: 818" ?? Thanks for sharing that link! LLL.in King, oportosanto and Jeff like this. That site is pretty great, updated and with all the necessary information. I actually saw something on this the other day at a site that I was pretty sure was trying to scam, so I have a little weary feeling whenever I see that. I think that this is a risk with some of these new domains. Good trend , there is a small increase in LLLL.IN regs despite drops, a good sign.